This image demonstrates a figure that is CENTRED , and also grounded. They are in the middle groudn of energy - drawing energy from the universal "heavens" and infinite above, and also connected to the earth by drawing energy UP from the CORE of the eath. When we are in balance - our auric field is like a bobbin on a string - not too high and not too low. If our energy is more anchored to the earth, then we may lose our capacity to hold "celestial connections", we will become bogged down by the mundane things of the earth. If our connections to the "heavnes" are too high, and the grounding is not anchored, then we will become "out there" and have difficulty dealing with reality. For an energy worker or psychic reader - they temporarily "unground" and "go high", bring the information through and then need to go and ground and centre again to become balanced in their own lives to ensure they address their physical realities. I cannot stress enough the importance of "Centring and Grounding" whetheryou are an energy worker or not. ALL people need to put some attention on focussing that they are cnetred and grounded daily to ensure that they maintain a healthy balance within themselves on all levels - emotional, mental, physical and spiritual. Failure to centre and ground results in imblances that can potentially lead to some very unstable thinking, feeling and BEING. It is more imperative for the "energy worker" to ensure that they centre and ground at times in between clients or seekers, to ensure that they maintain purity of messages and energy, and do not end up projecting or transferring messages or energy that are "tainted" with either their own personal issues or the issues of the previous seeker. An observer can quickly see when there has ben a "cross over" of energy or when a reader or energy worker has "gone too far before grounding and centring". Their information becomes unreliable (and even way off the mark", or the messages they are delivering lose clarity and become "muddy". If we are not grounded and centred - we are not able to determine "our stuff" from another persons "stuff". When we are honest with ourselves and others - we are standing in our POWER. Being centred and grounded allows us to know our limits. We don't have to have all the answers - and we don't have to be able to give them all to people. When we are grounded and centred we are comfortabel in saying " I don't know", but if we are caring we can also say, "perhaps you could explore?". and even point them in a directino to find the answers that they seek. I have always stated that the saying of "its easier to see and understand when looking in the window from the ouside, than it is looking from the inside out the window". If we equate this to, as a demonsration. If I am sitting inside my loungeroom with the curtains open - the person outside looking in the window, will see all the other environmental factors, they have a broader view of what is going on. The person on the inside in the loungeroom - only sees what is happening in their own room, and the little bit of limited and restricted vision the window provides. We can learn a lot about life and others through observation and see how it applies to our own lives. The REAL Facebook Group offers an opportunity to observe and learn about energy and messages through observation and as a person becomes more comfortable, through active participation. Examples of how a to identify a person who is ungrounded, is their often inabilty to provide practical assistance, and their own ability to practically and actively work on their own issues. They are busy "out there" with the fairies, angels and "higher beings", and basically soaking up the wonderful energy that they can tap into. To not use this energy in practical ways on the earth plane from my perspective is energy and universal wisdom that goes to waste. There are many different techniques you can use to "centre and ground your energy". In this article I hope to assist with providing a few that you can use to set you on your path of finding what exactly works for you - we are all diffrent so what works for one person - may not work for another. When we are grounded, we are present and clear of any attachments or behaviours that are less than love or loving. We can do this very quickly in a visualisation exercise. By imagining that we are a tree, or rather that our auric body is a tree. If you suffer from stress and anxiety - you may want to involve some activity in this exercise, physically do what others are "imagining they are doing". Stand tall, reach your arms up over your head and extend your fingers upwards to ward the sky (as the top half of the tree, sun radiating downwards through the leaves, and down the roots and down into the earth). . See and feel the light of the universe (Sun/Heaven/Masculine Connection), pouring from the heavens, through your fingers, hands and arms, and down to your heart. Then exhale from your heart thorugh your own "trunk", (your crown, torso, limbs), pushing the energy of the sun, out and down, through yoru body and deep into the earth, from your feet. (Much like the root system of the tree). As you are drawing this energy in - you are focussed on yoru breath, breathing in the light of the sun, and then pushing it through your body into the earth on the exhale. With your next breath - draw the energy up from the root system of the earth, up through your body to your heart/mid section, and then exhale it out through your crown and fingertips. A good colour to use in this exercise is actually the colour white - white in truth has all the colours of the rainbow within it and is iridescent, much like the interior of a pearl shell. You may want to do this exercise a number of times. 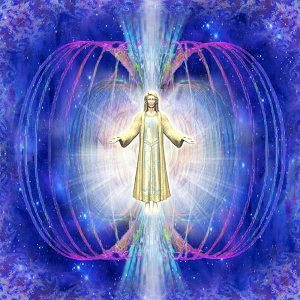 If youa re wanting to draw angelic energy into your aura, you can do the same technique but instead of visualising the white light - replace it with the image of a "rainbow" that starts in the infinite heavens, and ends at the core of the earth. 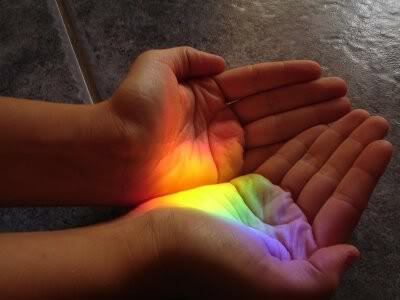 You may find that this energy may be a a little strong - if so - purely allow the "excess" to be shaken off by standing outside and stomping your feet (another grounding method) or "shaking your hands", or visualising the energy coming out of your feet (the rainbow) spraying beautiful and PURE angelic energy where ever you walk. Centring with the Rainbow (a Meditation). NOTE: Some people find it easier to visualise the chakras as coloured balls of light, where other find it easier to visualise a funnel, or a lotus flower. Go with whatever method you feel comfortable with. Also this meditation is a demonstration that when we allow things to occur naturally - and don't force it, then the universe will show us what wee need. We don't call for the specific colour of the chakra - there are only so many primary shades, for example - orange is a mix of yellow and red. By drawing on the rainbow, the chakras have intelligence of their own, and will absorb the colour that they need for YOUR perfect balance and function right NOW. Take a few deepr breaths. Allow your breath to take its natural rhythm. Relax your mind and for now, let go of any thoughts and words.. allow yourself to BE in the moment, to BE in the rhythm of your breath. Visualise a ball of light above your head. This ball represents your Soul or "Higher Self". In your minds eye see another ball of light above the "Higher self Ball" - it is larger and represents the Source of all living things. Now in your minds eye, see a beanm of rainbow coloured light entering into your Crown from the Source.As it enters into your crown - it passes through your Soul - the core of your BEing. As it enters your crown, feel and sense the crown chakra taking in the colour it needs to expand and release. Now in your minds eeye feel this rainbow coloured light entering your THird Eye. Release anything that is no longer serving your Highest Good, into the Source for transmutation. Feel the the rainbow light entering into your Third Eye, and feel the colour that it is drawing on to expand and release. Now in your minds eye, see the rainbow light entering your throat. As it does so - it releases that which it no longer needs back inot the source - and at the same time fills it with the perfect colour it needs for your Highest Good. The rainbow light shifts down, into the Heart, the Solar Plexus, The Sacral area and ends by filing the Base with the perfect light that it needs. Throughout this exercise - each chakra is releasing that which it no longer needs and expands by drawing on the colours needed to support the highest good and best function of each chakra. When you have completed the chakras, send the rainbow light down into your legs, and out into the world where it can be used as needed. When you have finished.. visualise a smile in each chakra. This exercise will attune and balance your energy field and enable you to see yourself as more than a physical body - more than your emotions and more than your intellect. DO NOT FORCE -allow for a gentle "happening to occur" (forcing and straining is counterproductive and may end up creating a self induced psychosis! ), If you suffer from a mental health condition this meditation MAY not be suitable for you - check with your GP or mental health practitioner). Set the scene as with any meditation. Make yourself comfortable with your back straight. Breathe deeply for a about five breathes - big breathes in and big breaths out. Allow your breathing to settle to a more comfortable and more natural rhythm. Slowly place your attention away from your environment and onto the IN and OUT of your breathing. Let go of all thoughts, and any preconceived ideas. All your thoughts to come - and go, floating in and out like clouds in the sky. Place your attention onto your physical body, and notice where you may be holding onto some tension. Breathe deeply and evenly into the parts of your body that feel tense, and in your minds eye see the tension stretching out and relaxing. See the area becoem smooth and soft, and affirm to yourself " I have a physical body - and I am more than my physical body". Now place your attention on your emotional body. Be aware in thsi moment ofyour feelings. Do an inventory or scan of your feelings, your emotions. Breathe into these feelings and see yourselllf letting them go.. see them fade away as you breathe into them. Affirm to yourself " I have an emoitonal body - and i am more than my emotional body". Now shift your awareness to your Mental body. Note your thoughts, and notice the activity in your mind. Notice any Mind chatter. Breathe deeply and slowly into your mind asking it for quiet. Relase all thoughts until you arrive at your place of stillness. Take a moment to feel the stillness with and affirm" I have a mental body and I am more than my mental body". Focus your attentioin now onto your Crown- the uppermost point of your head and affirm to yourself " I AM center of pure awareness and higher spirit". Allow yourelf to FEEL the experience thatthis statmeent brings to you. FEEL te power and the grace as new energy flows through you. SEe yourself as an energetic and living field that has consciousness and love. This love flows to you from an INfinite source. YOu can send this love to others in many ways. Affirm to yourself, "I AM in the flow of my power. I AM a Channel of power and that power is LOVE".